US, 2005, 112 minutes, Colour. Keke Palmer, Laurence Fishburne, Angela Bassett, Curtis Armstrong, J.R. Villarreal, Sean Michael, Sahara Garey, Lee Garlington, Craig Wasson. In recent years, American cinema has experienced something of an infatuation with spelling bees. They seem to be more of an American phenomenon than British, although the BBC recently featured a spelling competition series. There was also the wonderful documentary which did so well at the box-office and on television, Spellbound, which followed the preparations of eight youngsters for the national championships and pulled no punches in showing how gruelling this work could be for the students – and the pressures from parents. In 2005, Bee Season was released but, surprisingly, was not a box-office winner. Given that the cast was led by Richard Gere and Juliette Binoche, this seems strange. Given that it focused on an 11 year old girl who won the local and state competitions and went to the finals in Washington, this also seems strange. But, when you see it (and the recommendation is that audiences catch it on television or DVD), you will understand why. There is much more to it than the spelling bees. It is a film about words and thought about words. In fact, there are also fascinating religious dimensions to the film and a lot of God talk. 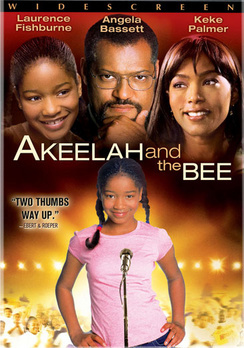 Now comes Akeelah and the Bee, the story of another 11 year old who wins the local bees and goes to Washington DC for the final. This one is geared to the widest audience. It is quite emotional – even a touch tearful and, with the music, sometimes pulls at the heartstrings. But, this does not really do any harm. In fact, this is a very positive film. Inspiring is the word that is often used. It is a film about the wonders of language, about study diligence and hard work, about having confidence in oneself and striving to achieve goals. Teachers and parents might be thankful to have a film around that encourages children to study. The setting is south Los Angeles, not the most conducive area for serious schooling. Schools are poor and lack facilities. Students are uninterested and tease intelligent children as ‘brainiacs’. The families are not on the poverty line. In fact, many are quite comfortable, but they have hard lives, single parent families and the boys are pressured by peers to belong to gangs. Akeelah is a bright 11 year old who still grieves for her dead father, a man who instilled in her a love of language. After initial reluctance, she enters the school bee and begins a year of preparation for the finals. The school is very supportive but her mother (Angela Bassett), busy worrying about supporting the family, is not. However, she is coached by a university professor (Laurence Fishburne), not just for recall training, but in a love and understanding of language and finding her own way of drawing on her memory. Actually, the plot outline is quite predictable, but pleasantly so, although the ending is something of a surprise. It’s very American in sensibility, more heart on sleeve in emotion than in British stories. It’s something of a Rocky for junior students and study. One of the best features is that the three main children are very persuasive, not the often obnoxious children we too often see on screen. Keke Palmer, in every scene, is wonderful as Akeelah, a young girl who goes through a wide range of feelings during her quest of victory. The endearingly lively J.R.Villareal becomes a good friend while Sean Michael is a credibly uptight superior student with one of the hardest of competitive fathers. Yes, it is encouraging and inspiring. 1.The popularity of this kind of film? Humane, optimistic? American insensibility? Sentiments? Competitiveness? For an American audience? Non-Americans? 2.The South LA settings, the contrast with Beverly Hills and the upmarket suburbs? The visit to Washington, DC? Authentic atmosphere? The musical score and range of songs? 3.The popularity of spelling bees in the United States, for education purposes, for affirmation of the children? The dangers of competitiveness, humiliation and defeat? The being branded as loser? 4.The opening with the word for not at home? The contrast with the ending and Akeelah’s comment on the word for being at home, love? The experience of love? 5.The conventions of the film, its predictability, audiences identifying with the characters, the sentiment, their hopes, anticipating what would happen? The spirit of Rocky and its achievement? A piece of Americana? 6.Akeelah and her sustaining the film, aged eleven, bored with classes at school, not turning up, her essay, the one hundred percent, the teacher and her concern, the principal and his concern? Her friendship with Georgia? Her being bullied as a brainiac? At home, her air force brother and his support, the brother out with the gang, the sister and her baby? Her mother and her constant work, tiredness? Her dead father, the memories, his story, the fact that he was killed, the effect on her, his photo, her talking to him, forging his signature for the spelling bee, absorbing his love of words, spelling helping her in her grief? 7.The spelling bee and her not being interested, seeing the glimpse on television of the nationals? Her being told to go, her fear of embarrassment, her determination to win, success? Larabee and his being present, observing, asking her difficult words, her failing to spell ‘pulchritude’ (and its being the final word at the end of the film)? Her embarrassment and shame, running away? 8.The personality of the principal, his concern about the school, coping, not having money, hopes for the spelling bee, friendship with Larabee, getting his support? The deal about Akeelah making up on missed classes with training with Larabee? His presence at the spelling bees? His ability to deal with Akeelah’s mother, especially at the state finals and the mother wanting Akeelah off the stage? 9.Laurence Fishburne as Larabee, a certain gravitas, his being a lecturer, his history, his wife leaving him, the illness and death of his daughter? Their (*HER?) toys in the house? Calling Akeelah by her name? His demands, Akeelah late, using ghetto slang, being insolent? Her return? His coaching her, the methods, the statement on the wall about our greatest fear not being that we are inadequate but that we are powerful beyond measure? His using this? His sharing his love for words, not learning by rote, the discussions of language, languages, his making her skip, the rhythms for her memory? His opting out? Her returning the rope? Their discussions, her plea, his agreeing to support her, going to Washington, buying the tickets, showing her the statue of Frederick Douglass? His taking on the new job? His being a father figure for Akeelah? 10.Akeelah’s mother, the children, the problems, her being tired, not listening to Akeelah, her reaction to Akeelah’s going uptown to the other school, her severity? Her reaction to Akeelah’s forging her father’s name? Not knowing about the bee, not knowing about the training? Her interrupting the nationals, the bargain with Akeelah, the punishment, her now supporting her, seeing Larabee to ask him to continue the coaching? 11.The brother from the air force, the possibilities for young people? The boy in the gang, the gang leader, his having written poetry, his support of Akeelah? The girl with the baby – and crying during the spelling bee, seeing the mother cheating? Georgia, her friendship and affirmation, her being hurt by Akeelah’s attitude, her not wanting to go into Xavier’s party, her being hurt, wanting to be a stewardess, getting the ticket, going to Washington? 12.Akeelah and the local bee, the nationals, her missing a word, the cheating boy, her getting a place? Her meeting with Xavier, his friendship, help, Dylan and the contrast with his severity, his father? Going to the school on the bus by herself, meeting Dylan and his arrogance, the playing ball and the spelling with the others, the birthday party, the Scrabble and the confrontation with Dylan, her overhearing Dylan’s father severe with him? Xavier and his brightness? 13.Xavier as a character, a performer, helping Akeelah, the party, compering the Scrabble, his parents and their support, his losing and his bowing and farewell? 14.The contrast with Dylan and his father, Dylan’s severity, the father spurning Akeelah? Akeelah overhearing – twice? 15.The judges, the regional competition, the cheating mother and her defence? The styles and the protocols of the competition? 16.The national competition, again overhearing the father, offering the can of soda for Dylan? Her decision to lose, Larabee and his awareness of what was happening? Dylan puzzled, also losing? Their discussion, Dylan not wanting to win with her giving up? The competitiveness and each of them going through to the final? Joint winners? 17.Akeelah and all her coaches, the fans on the television, her interview on television, the schoolchildren watching, the gangs in the neighbourhood, everybody cheering? The joy at victory? 18.Akeelah’s affirmation, her self-confidence and power? The optimism and sentiment of this kind of film?